Every FullStory account includes a set of pre-made segments in the lefthand navigation. 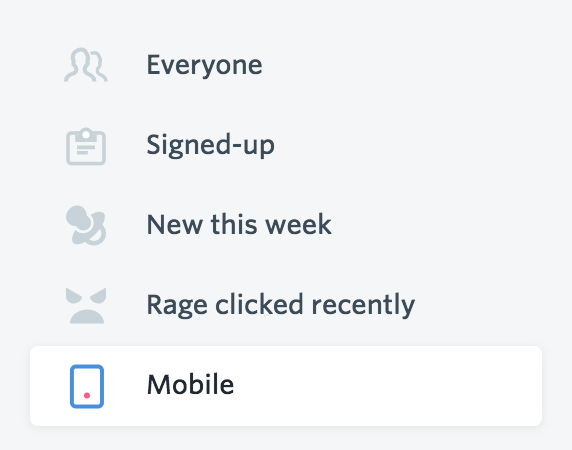 Look for the segment labeled "Mobile" and give it a click. In this segment, you'll find a list of sessions where FullStory detected that the visitor was using a browser with a User Agent string related to a browser on a mobile device. Note: for the purposes of reporting in FullStory, "Mobile" refers to small devices that are likely smartphones. We report on mobile tablets separately with Device = Tablet. Watch sessions to understand your customers' experiences on their mobile devices or scroll down to view insight reports specific to your customers' Mobile sessions. Sometimes the pre-made Mobile segment isn't specific enough. Maybe you only want to see sessions where a customers is checking out from their phone, or perhaps your interest is how many people complete a sign-up on mobile. Or, start a new search and just start typing "Device" to include the Device type query criteria in any search, segment, or funnel that you can imagine. Tip: If you have a favorite segment with an Event Funnel that you use to watch a conversion flow, copy the segment and use the Device query to make a "Mobile" version of the same funnel. Then, compare your funnel results! From any search or segment (pre-made or custom) you can scroll down to view your Device Breakdown for that segment. This smart analytics chart will show you the breakdown of how many sessions for your given search or segment happen on Mobile vs. Desktop or other Device types. From this view, you can hover over the label for "Mobile" within the chart to reveal an "Add to search" prompt. Click the prompt to quickly add the Device type = Mobile scope to all of the Event Filters in your current search or segment.